If you are looking to update the flooring in your home, consider installing tile. Tile continues to be a popular choice for kitchens and bathrooms alike. Tiles feature many different benefits such as being easy to care for and incredibly durable. Our showroom features a collection of ceramic, porcelain and stone tile which are all available in different styles, shapes, colors and more. Even though tile is a popular kitchen and bathroom option, tile can be installed in other places around your home including outside. At Thompson’s Floor Covering in Porterville, CA, our exclusive tile brands are backed by our award-winning warranties. Since tiles are installed as individual pieces, you can mix and match styles to create your own unique look. Our flooring professionals are waiting for you to stop by and to take a look at our tile collection. They can help you bring your ideas to live and into your home. 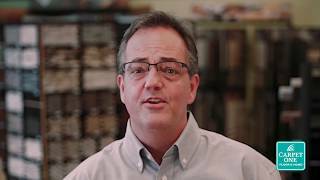 Join our very own Jim Aaron, VP of Merchandising for Carpet One Floor & Home, for some information on the three basic types of tile flooring: ceramic, porcelain, and stone. Where Can Tile Be Installed? Since tile is so durable, it has become a staple for kitchens and bathrooms. Tile can be installed in more than just your kitchen or bathroom; you can even have it installed in your basement. Other places tile can be installed include laundry rooms and even entryways. More durable tiles like stone and porcelain can be installed outside around your home as a patio or walkway. We also offer a selection of wall tile, backsplash tile, and shower tile. Bring your style up a notch by adding a backsplash or custom tile accent wall in your home. You can even customize your bathroom by installing a tiled shower, which adds style and even value to your space. Our tile selection features porcelain, ceramic and stone options for you to choose. Ceramic and porcelain tiles are made from the same materials like clay and sand, although all porcelain tiles are ceramic, not all ceramic tiles are porcelain. Porcelain is categorized differently because they are denser and resistant to moisture and heat. Ceramic tiles are light-weight and easy on your budget, and are available in an array of vibrant and neutral colors. Our stone collection features unique options for you to explore. Stone slabs are quarried from different locations, so no two tiles will look the same. Other tile options we offer can be made from different materials including glass, metal, and even concrete. Mixing different types of tiles into patterns can create amazing dimension and also make it stick out from the rest of the décor in your home. You will most commonly see mixed materials in backsplashes and custom tiles showers. As your locally owned Carpet One Floor & Home we carry exclusive brands like Bel Terra. Our exclusives are backed by quality and award-winning warranties. As a member of the Carpet One Floor & Home cooperative, we deliver our customers quality flooring every day. Be sure to visit one of our showrooms today located in Porterville, CA. At our showroom, we offer porcelain, ceramic and stone tiles that can be installed on your floors, walls, and even outside. We are bound to have a tile the suits your needs and style. Follow the link below to learn about different types of tiles. As long as you keep a regular cleaning schedule, your tile floors will look beautiful for years. Be sure to follow the manufacturer’s cleaning guidelines. Follow the link below to learn about a few tile cleaning tips.